For more than 15 years, people suffering from multiple sclerosis have relied on a drug called interferon-beta to prevent flare-ups of the disease and avoid its crippling neurological symptoms. But interferon-beta treatment has its downsides: the drug is expensive, it can cause flu-like side-effects, and for up to half of patients, it simply doesn't work. New research from Duke University may point to alternative treatments for MS. By studying an MS-related disease in mice, scientists honed in on the biological mechanisms that can lead to a non-responsive form of the disease. They were able to identify new drug candidates that might help MS patients when interferon-beta treatment fails. "The study shows a really clear molecular mechanism that may explain why some people do not respond to interferon-beta treatment," said Mari Shinohara, an associate professor of immunology at Duke and a senior author on the study, which appears Nov. 7 in the journal Nature Neuroscience. "We've found what makes a difference in the response." In multiple sclerosis, the body's immune system mistakenly goes on offense against the nervous system, eating away at the protective coating that wraps around neurons' long, signal-carrying arms. Without this wrapping, neural signals get jammed and don't always make it where they need to go, resulting in a vast array of neurological symptoms. Researchers are still sorting out the biological mechanisms that lead to the neural damage of MS, making it tricky to find effective treatments. To add to the challenge, is mounting that the mechanisms could vary from patient to patient, depending on the exact mix of genetic factors and environmental stimuli that led to their disease. In a 2012 mouse study, Shinohara's team found that interferon-beta works by inhibiting a giant immune protein complex called the NLRP3 inflammasome. The NLRP3 complex appears to play a key role in triggering the faulty immune responses that make MS patients sick. 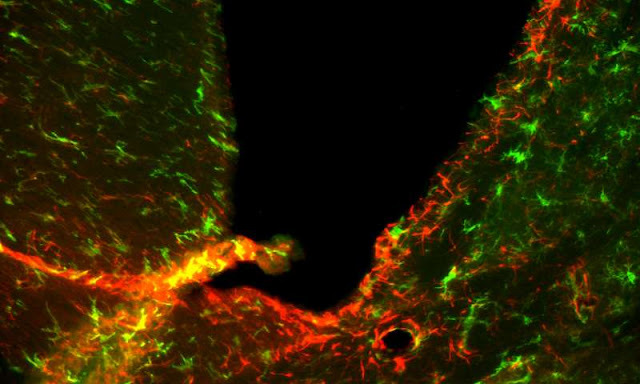 However, in the same study, they also found that some mice got sick even without this inflammasome—and in these mice, the interferon-beta treatment was completely ineffective. In the current study, the team wanted to figure out how this second form of the disease was triggered. "We knew the second pathway bypassed the NLRP3 inflammasome," Shinohara said. "So the question became, what is actually involved?" They found that two specific receptors, called CXCR2 and LTBR, were central to the development of the disease in the mice who did not respond to interferon-beta. And they found that treating the mice with a molecule that blocks these receptors improved their symptoms. "We found that, depending on which type of disease the mice had, we could choose the appropriate treatment," Shinohara said. To see if the CXCR2 and LTBR receptors might also play a role in human MS, the team used data gathered as a part of the Murdock-MS study in Kannapolis, NC to compare the genetic profiles of MS patients who responded to interferon-beta treatment with those who didn't. "We identified individuals who were not responsive to the interferon-beta treatment, and looked at their CXCR2 and LTBR relative gene expression levels," said Simon Gregory, a professor of medicine and molecular genetics and microbiology at Duke and a co-author on the paper. "We found them to be upregulated," meaning they were producing more of the receptors, he said. These results have the researchers hopeful that targeting the CXCR2 and LTBR receptors might prove a successful treatment in human MS patients. They also plan to explore whether screening for elevated expression of the CXCR2 and LTBR genes might help doctors identify ahead of time which patients are likely to benefit from interferon-beta treatment and which won't. "Now these patients have to go through all the pain, inconvenience and cost of interferon-beta treatment, only to be told that it doesn't work for them," Shinohara said. "So it's a big problem, and it would be really nice if we could tell upfront which treatment works."